Are you planning to build a one-storey house for your family? If you are, then you are at the right page. Single-storey family homes are actually good especially if your lot area is big. Like taller homes, you can also add more rooms in it, depending on your available floor area. But what we like most about one-storey homes is the variation of the layout which depends on the size and shape of the lot. Even mere rectangular lots have different layouts and every designer has his own way of maximizing the available space. Surprisingly enough, many homeowners prefer to have one-storey homes. This saves them from going up and down. However, some family prefers homes with an upper level especially if there are floods in the area or possible tsunamis. There are lots of things to consider when choosing the design of a home. Today, we are going to show you 20 modern one-storey home designs which you can use as inspiration for your houses. The name of the house is based on its location since it overlooks to a beautiful treed golf course. 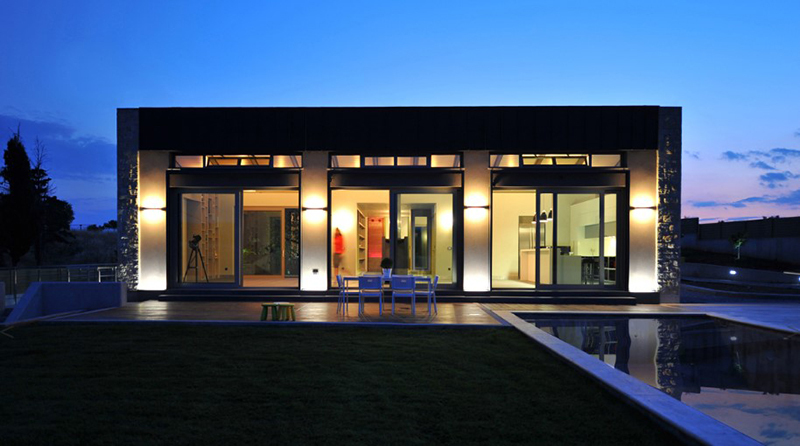 It was designed for a golf-loving, retired couple who like to entertain their large family that visits them regularly. 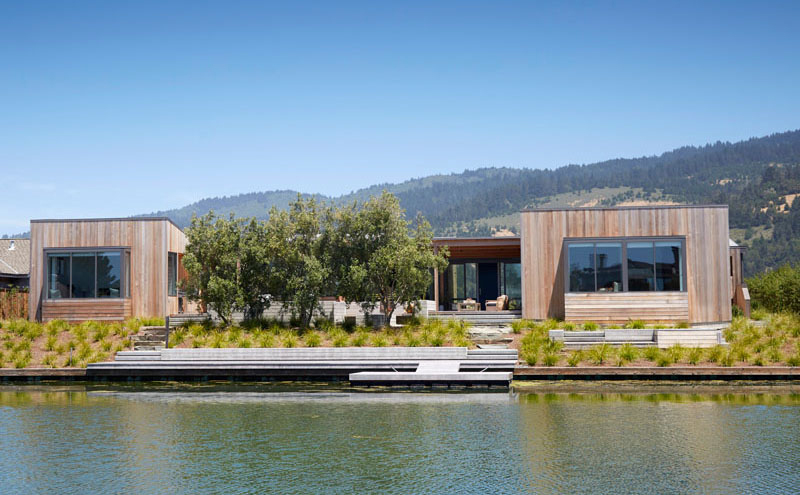 This wood-clad single storey house in Stinson Beach, California features minimal landscaping at its front area while it gives a good view of the lagoon beside it. Inside the house, it features wide board oak on the flooring while the ceiling is covered in cedar. 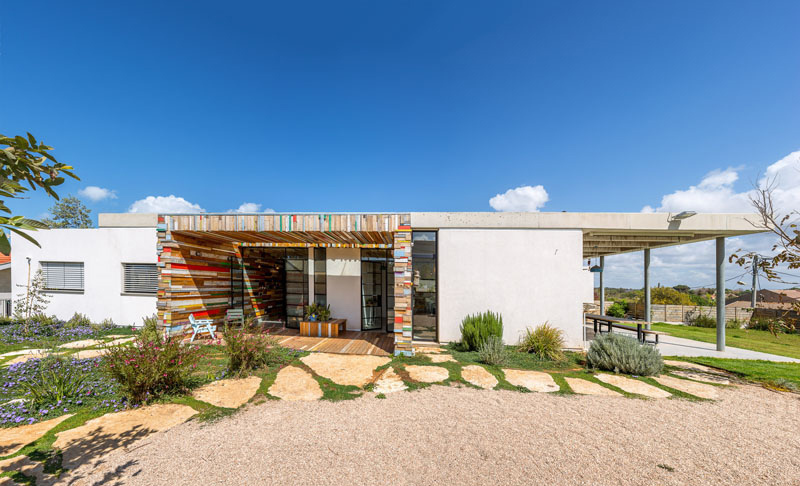 This home in Israel looks very interesting with its walls covered in a variety of scrap wood pieces for its art studio. Now that’s one intelligent way to use scrap wood! 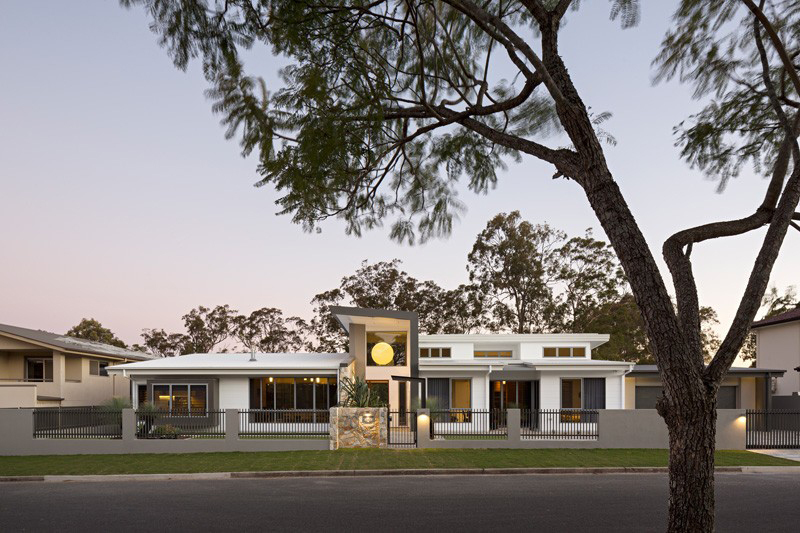 The house is located in Queensland, Australia which was designed to embrace and enhance a magnificent 100-year-old fig tree at the center of the site. 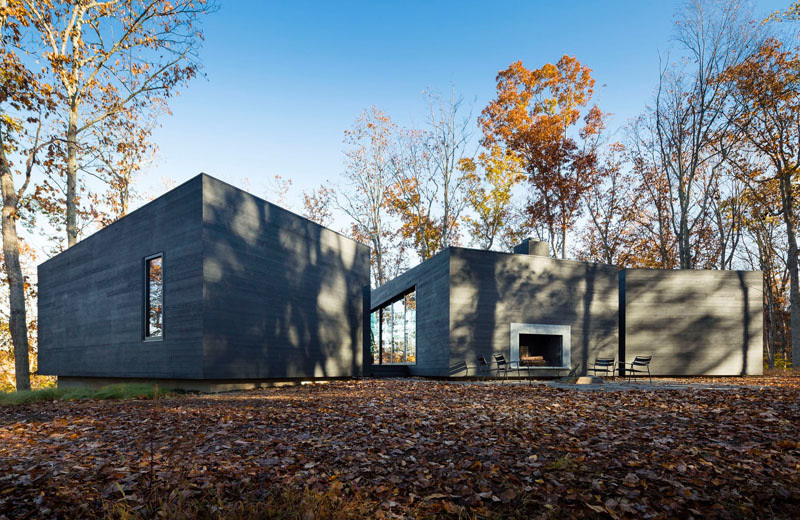 The tree became the focal point for the design the house. It has an elongated plan with views of the fig tree and the hills. This residence is designed as a collection of single-storey pavilions that are systematically distributed across the landscape. 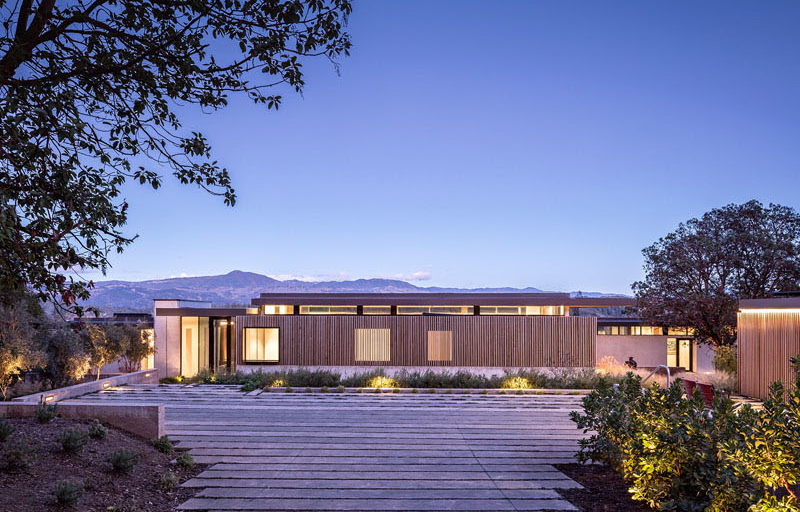 It features a low wall that is clad in stone while its undulating roof plane visually connects it to the natural landscape of the home. A family with three young boys lives in this house which is located deep in the woods. One needs to travel almost 1/2 mile long drive in order to reach it. 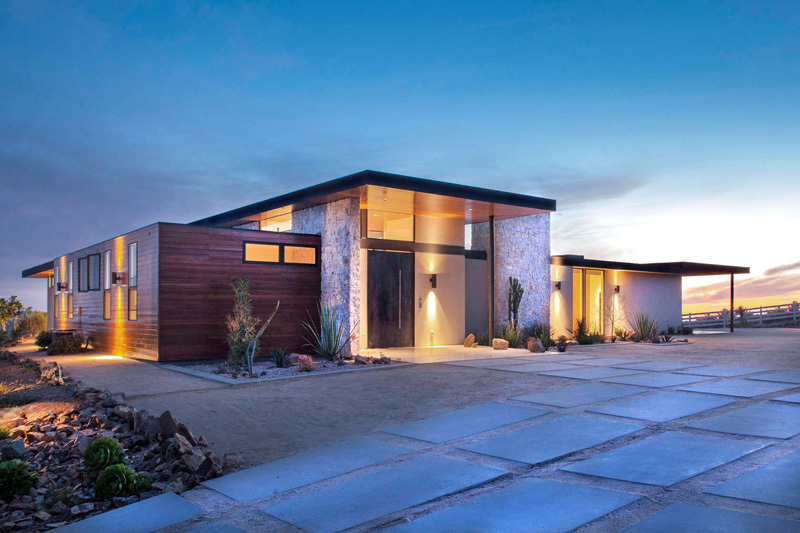 A studio/garage welcomes the guests where they can leave their cars and walk to the house, allowing them to take a little hike towards the home. This house is designed based on courtyards to protect it from the shadows of the trees and to bring it closer to the moisture of the soil. 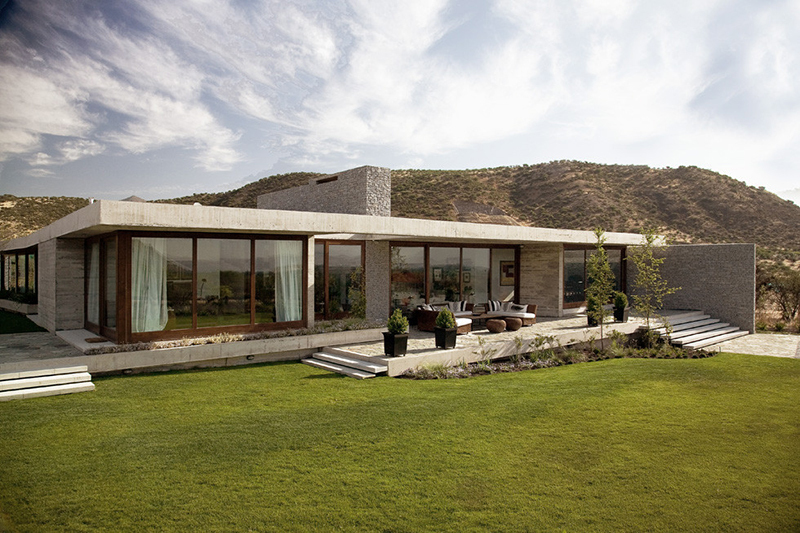 Stone walls are used which contributes in protecting the house from sun exposure. It’s 205 sq.m. floor area is maximized creating a beautiful modern home. It also features a basement which contains secondary functions like storage rooms, laundry room, and the garage. 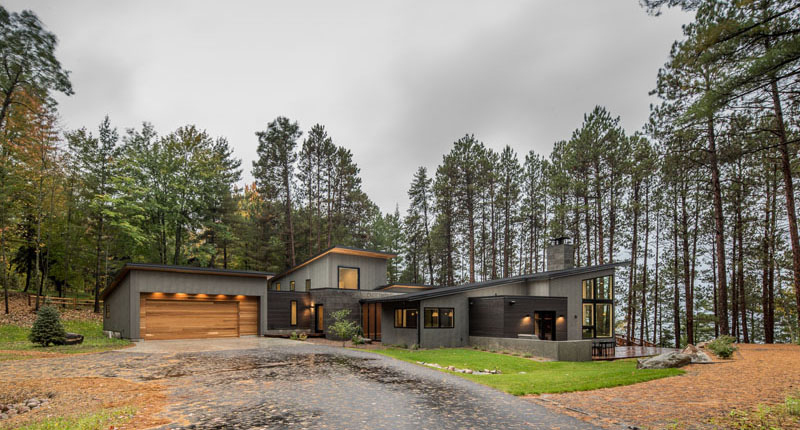 This vacation lake home in northern Minnesota is designed for a young couple who loves Scandinavian architecture. They also want their home to show their active lifestyle while celebrating the natural woods environment. This holiday retreat in the North of Spain is based on a traditional construction called ‘cabaña pasiega’ (peasant cabin). It is a stone cottage with a contemporary twist wherein all the materials used to build it are reused from the old stone shed or come from Cantabria. 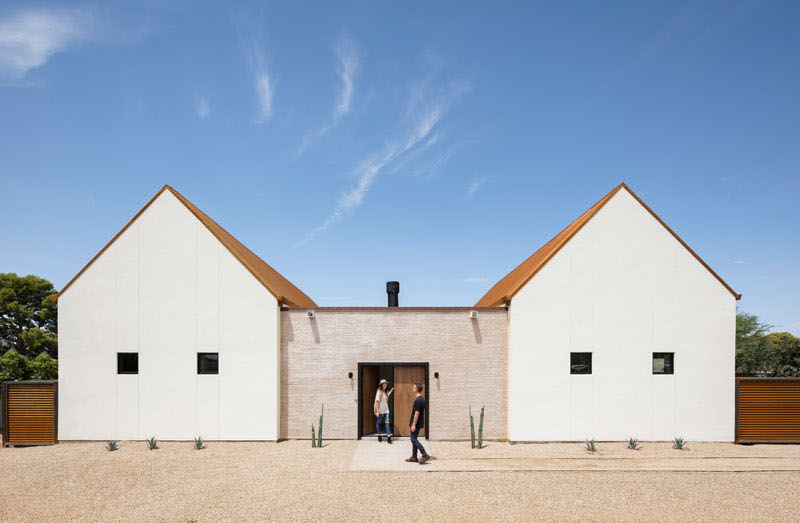 This house is located in Phoenix, Arizona which is inspired by the forms of the missions in southern Arizona. 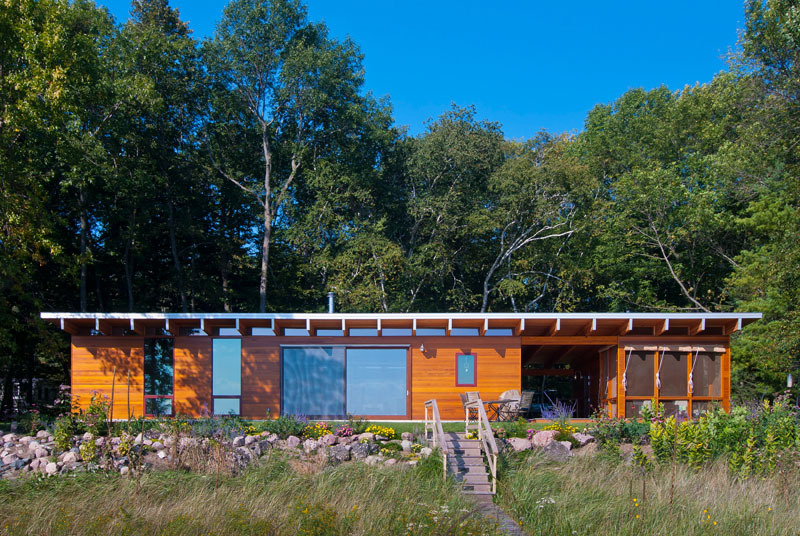 Its exterior is white combined with sandy colored bricks and rusted, corrugated metal roof. 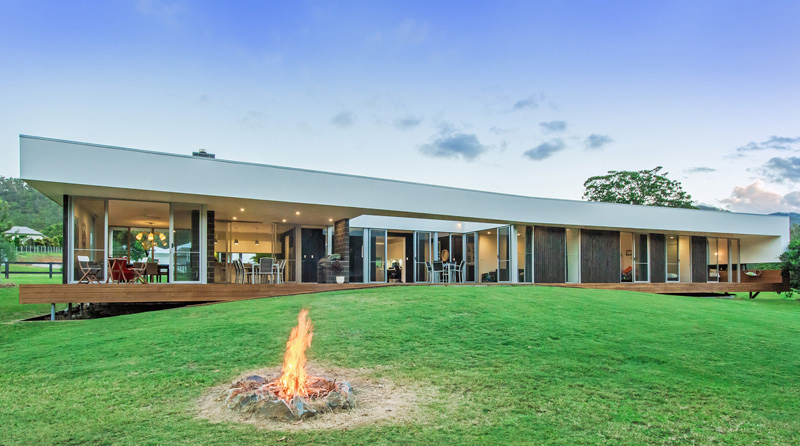 Its central courtyard is anchored by a rusted steel clad outdoor fireplace which separates the living and sleeping wings of the house. We recently featured this house located in Beverly Hills. This one-storey home has a lovely entry and foyer with green walls in various areas. 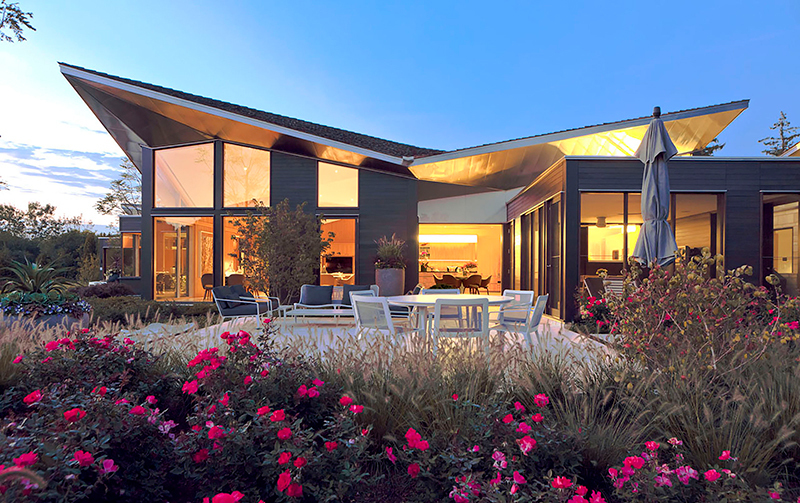 A modern home in Healdsburg, California, that has views of Dry Creek Valley from every room. 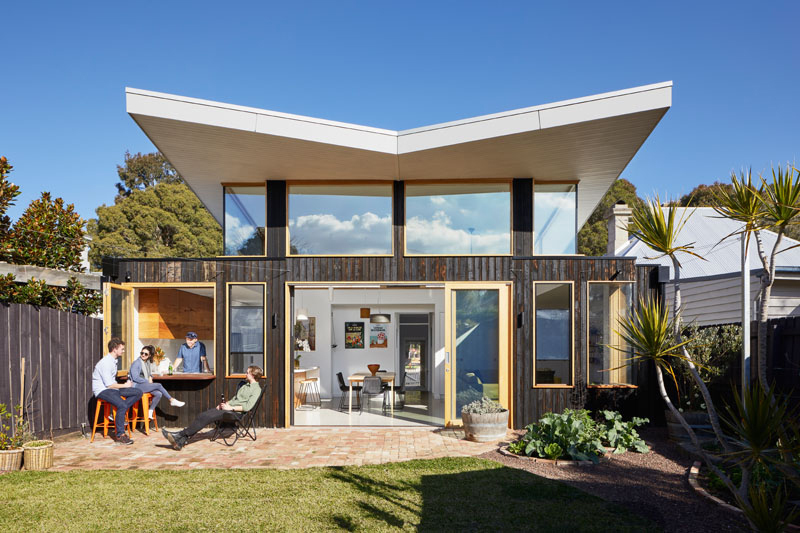 The project is a renovation and extension of the home. Don’t you love the vertical blinds in its facade? 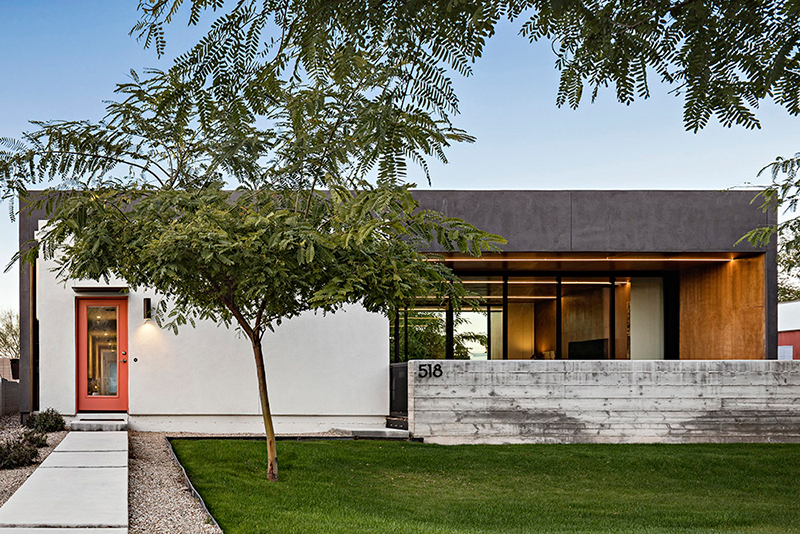 Located in the heart of uptown Phoenix is this 3 bedroom, 2 bathroom spec house which is designed as part of the urban fabric connecting it both to its site and its neighborhood. It features a 24 foot wide sliding glass walls that completely open the living and dining spaces to the outdoors. 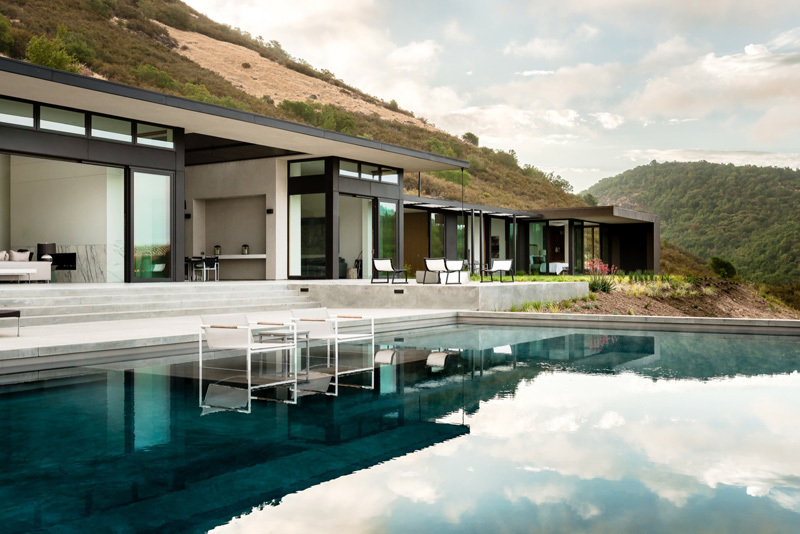 This is home located on a hillside above the Silverado Trail, in Oakville, California with views of the vineyards of California’s Napa Valley. As you can see it has a beautiful design and the interior is seamlessly connected to the outdoor area especially to the pool. This modern house extension in Melbourne, Australia opens up its rear portion to the sun a desired by the owners. One of its distinct features is its sculptural roof which sits over the extension. Clerestory windows follow the roofline to allow sunlight to enter the interior from all sides. Wood, white and black colors are all combined for this beautiful residence. It is actually a renovation of an old home and if you will see how the old house looks like, you will surely be amazed. The design of this home features a touch of Belgium’s culture and it is focused on family living and entertaining. To take advantage of the lot, the house blends both the indoor and outdoor spaces. 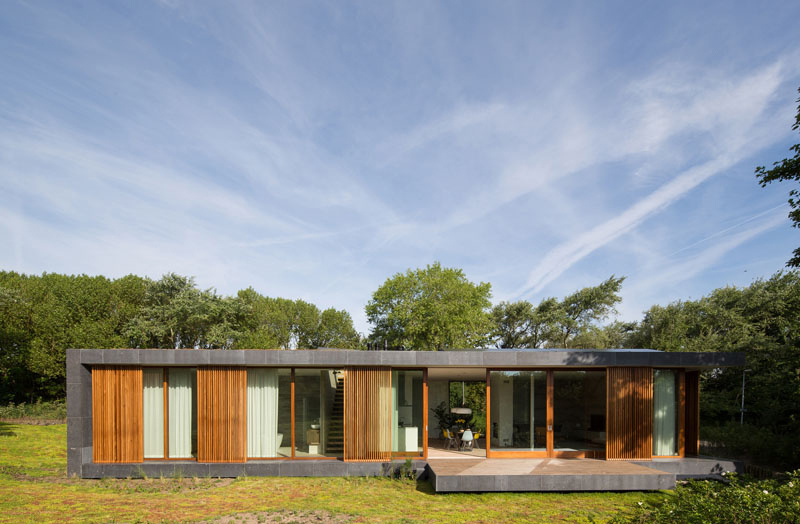 This villa is located in Hoek van Holland, The Netherlands, which combines concrete, wood, and natural stone. 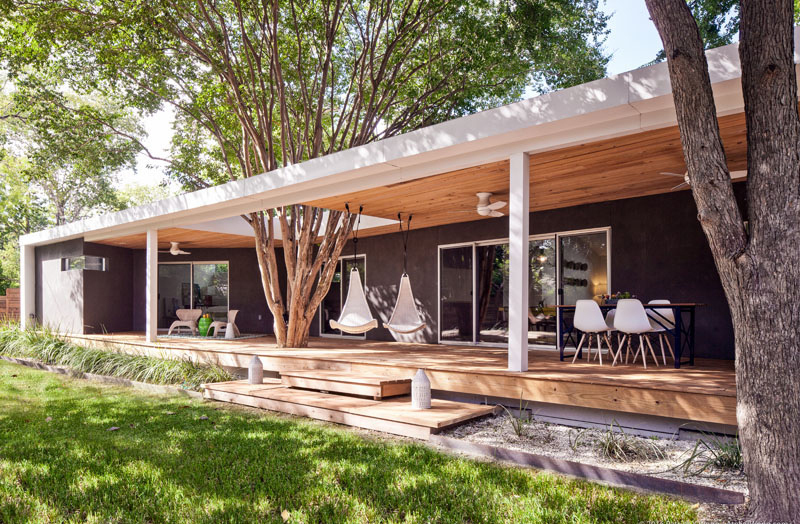 The facade of the house provides shade, privacy, and protection to the home. Even if you do not have a two-storey or three-storey home, you can still achieve your dream house. Everything that you want for a home can still be in it just like what we saw in the homes above. Some of them are even luxurious and sophisticated while others are kept simple. But whatever is the design of the homes, they all look beautiful and all of them are perfect for anyone who wants a home without stairs! Are you planning to build a one-storey residence? This round-up will surely inspire you for your home’s design. Can you tell me which among the houses is your favorite?